Bagleys Glass at Pontefract Museum MuseumKnottingley became a centre of glass-making in Victorian Times and the area continues to produce glass today. 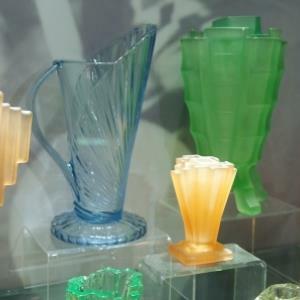 Pontefract Museum is home to an incredible collection of Bagley’s glass. Bagley’s heyday was the period between the world wars (1918-1939) when the firm became a leader in inexpensive domestic pressed glassware. This was achieved by its wide range of products, experiments with coloured glass, expanding domestic and foreign markets, and a Royal seal of approval. The display at Pontefract Museum explores the history of glass making in the area from roman times to modern day; looks at what it was like to work at Bagley’s; and shows many examples of pieces made. Knottingley became a centre of glass-making in Victorian Times and the area continues to produce glass today.